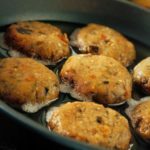 These mini eggplant and herb burgers can also be served up as a tasty side dish or as part of a buffet with a tasty dip. 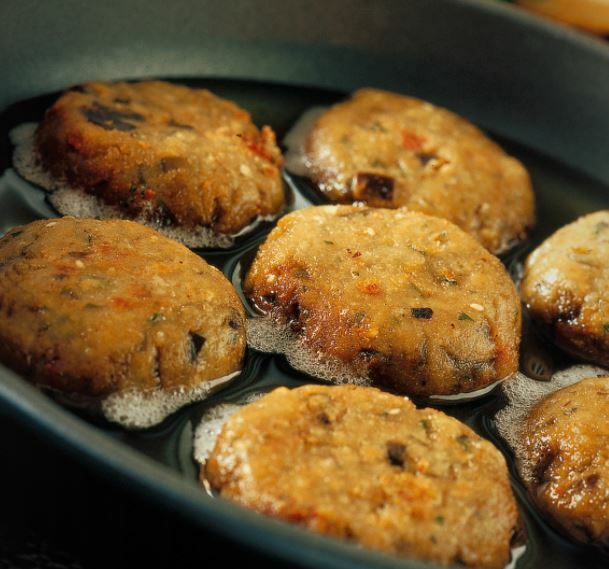 If you don’t intend to use them all at once, you can freeze your eggplant burgers. Simply lay them on some baking paper in one layer, pop them in the freezer before packing them either individually or in packs of as many as you need. Blanch the tomato, peel it, remove the seeds, coarsely chop the pulp and let it drain into a colander. Peel the eggplants, cut them into pieces and blanch them for a few minutes; drain, squeeze and pass them to the mixer until you have a not too fine mince. Brown the peeled garlic in a pan with a little oil over a medium to low heat and add the aubergines, tomatoes and some marjoram. Keep stirring to cook off as much of the moisture as possible until it is quite thick. Remove from heat, remove the garlic and add the salt, pepper then set the mixture aside to cool. When cooled, add the egg, cheese, chopped basil and a little breadcrumbs. Form small eggplant burgers, about the size of your palm (flattening them slightly), until all of the mixture has been used. Deep fry them in hot oil until they are golden brown and transfer them on the absorbent paper. Serve them hot as a side dish with some sour cream.